“My family started doing community foster care three years ago after realizing the potential our family had for doing good. We saw our opportunity in foster care, and once the decision was made it took less than four months to get our first foster child. He was a three month old baby boy named Aiden. We instantly fell in love with his deep blue eyes and adorable belly laugh. As we bought new clothes for him and hauled him around to all our social events, he became a part of our family; he was our newest little brother. And yet he didn’t belong to us, and we were continually reminded of this as we met his mom and grandma at their twice weekly visits with him. One of the hardest challenges we found in doing foster care was this paradox: You love the kids like they are your own, knowing full well they will someday leave. But should that knowledge keep you from loving them while you have the opportunity? We decided that it didn’t, even after Aiden left seven months later. Together my family grieved and cried over his departure and then found we still had more than enough love to offer another child. Since we became a foster family we have opened our home to seven different children, discovering that loving these kids is a difficult task but one that brings many rewards. 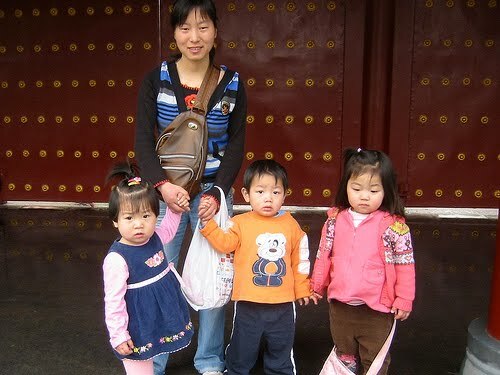 Now my family is embarking on another adventure together: adoption. Two of our little boys have no home to return to, so we are blessed to become their forever family. Foster care has revealed many things about the nature of our family. My mum often says, “it’s brought out the best and the worst in each of us.” We’ve gotten overwhelmed at times and struggled to see how the sacrifices are worth it. But we’ve stuck together and gotten though. This entry was posted in Bring Me Hope News on May 28, 2010 by admin. They moved into their new house a week ago and have settled in well. They are in the next building to us so we can visit every day and play with them in the playground. We have been busy decorating with rainbow colours and butterflies and filling the house with toys and books. We are so excited about the new lady who has taken on the job of caring for the kids. She is 28 years old and really loves G and the kids. They also love her and are enjoying playing with her. And we are also employing another lady during the days to help with shopping, cooking and cleaning and “toddler entertainment”. I came home one day this week to much screaming and laughter as they all pranced around the house singing “J loves me “ at the top of their voices. We are going to call our venture “Elim Kids”. The name was given to us by a Chinese co worker and represents the “sweet waters”of life in a family compared to the “bitter waters”of life in an institution. (see Exodus 15 :27). 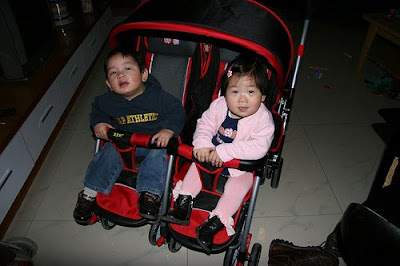 The kids are delighted with their new mode of transport – one of the few double prams in China. Maggie has been suffering a bit of “pram envy “ but is happy to have a ride every now and then. This means we and other can take them out to the park to play and for walks. (when it finally warms up ). Peter and Chloe will soon need to employ a secretary as there are so many people to take them for a walk , play with them and even have them for a sleep over. This has been great as gives their carer a much needed rest from being a single mother to 2 toddlers. 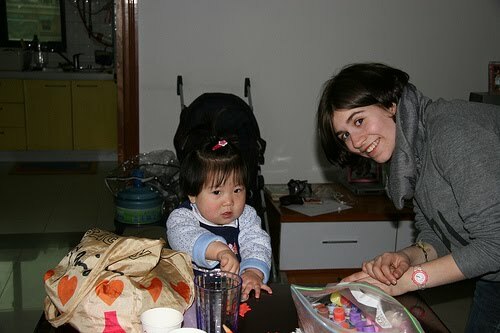 This week they were happy to play with hair clips and face paint with some English volunteers who came to help. Peter and Chloe (and Maggie ) are gradually learning what it is like to live in a family. Lots of love, food and cuddles, toys and books but you also have to share ! Some days it is a hard lesson to learn but it is good to see that these days they actually have things that they can share! Thanks again for amazing support with finances, prayers, sewing, fundraising and more. We really appreciate it and have enjoyed seeing first hand how “He sets the lonely in families”. I am also excited to say that a good Aussie friend of ours is looking at setting up a similar house for those with special medical needs. We hope to transport them to a new house a block away and be able to support her and these very sick kids in a similar way. This entry was posted in Bring Me Hope News on May 27, 2010 by admin. Michigan Siblings Shoveled Snow to Raise Camp Sponsorships! It is a long standing practice in my family to shovel snowy sidewalks for the shut-ins and elderly of our neighborhood. So it was no surprise when this past winter, my three youngest siblings were out any chance they got helping those who could not do it themselves. Unlike many of the other kids around our area, the help given by my brother and sisters is given freely, as they do it for the Lord and not for pay. However, there are many kind and generous neighbors who appreciate the attitude displayed by the kids and the work done, and pay them nicely. In the past, the kids have used a portion of this money for projects such as supplying a cow or a few chickens for a poor family in India, or have financed a well-dig in some far off country. This year, Katren (14), Caeley (12) and Samuel (10) set one of their biggest goals yet. The three of them came to me with an envelope and big smiles one night and said, “We are going to send an orphan to camp to meet you!” They excitedly explained while showing me they had saved the money to sponsor a child for a full week of Bring Me Hope Camp. Further heart-warming, they did not even want the sponsorship to be in their name! 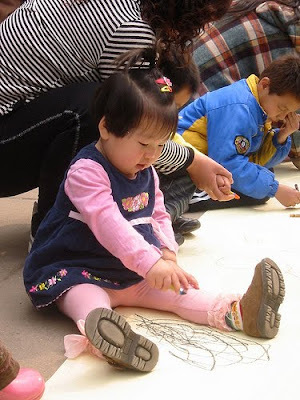 Last year, my brother Sammy had come to me with tear filled eyes and said that he felt sure I needed to go be a big sister to some little kids over in China. This year he helped make that possible. I am one proud big sister, let me tell you! This entry was posted in Bring Me Hope News on May 24, 2010 by admin. 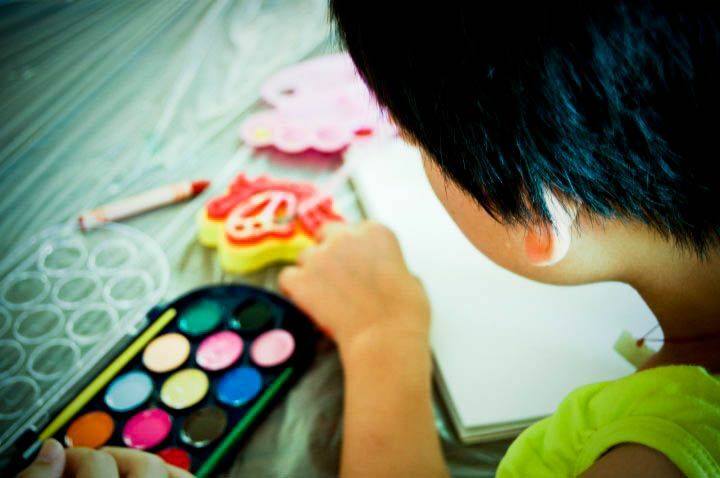 Bring Me Hope staff member Kristen Chase is tying together two passions of hers this summer: Orphans and Photography. “Many of the kids love taking pictures during camp, and I wanted to give them an opportunity to have a hands-on experience with it,” Kristen said. “They have been through some really hard things, and I hope this will be a time of self-expression and healing for them. Plus I love seeing what they come out with when they’re given the attention and chance to succeed at something they’re interested in,” she adds. Providing each of her students with a digital camera, the children will learn the basics of photography and then go out “on the field” to practice. “We have some fun outings planned. I’m going to take them to parks, up to the mountains, and maybe even a zoo…if we can find a zoo in Nanchang,” Kristen said. The Invision Project is looking for people to donate gently used digital cameras, SD cards, and rechargeable AA batteries. This entry was posted in Bring Me Hope News on May 22, 2010 by admin. This entry was posted in Bring Me Hope News on May 21, 2010 by admin. In the summer of 2006, we met a boy who touched our hearts. His name was Charlie. Charlie shared with us his very vivid memory of being sold by his father. After the police were involved with his situation, Charlie was moved to an orphanage. But he longed for family life. “Charlie is doing well! He is in a public school which is one of the best in our area and is just 15 minutes by his bicycle. He has grown a lot! 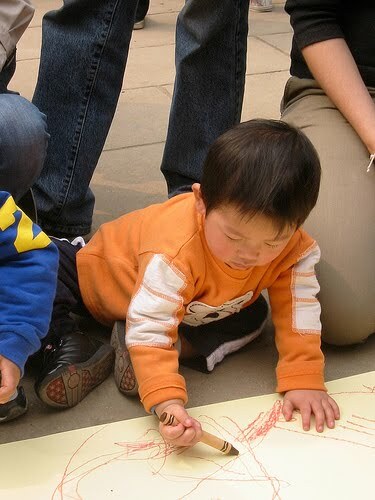 And he is learning English, but like most of the Chinese kids they don’t want to speak it out. He gets embarrassed when he says it wrong, but we tell him its fine and the more you speak it the better you will communicate. Now when he wants to say something, he will spell it and we will speak it then he will repeat it! It’s so funny. Charlie is doing well in school. He has a lot of awards for high scores in his subjects. He loves to cook spicy food, and is very good cooking fried rice. 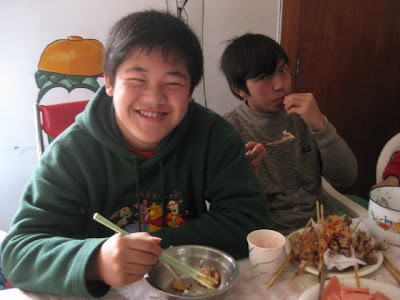 We tease him that we should send him to Baoding cooking school, one of the best cooking schools and well known in China. We feel he has a relationship with HIM. He is joy to us, very obedient, smiles a lot, and is very grateful for everything we buy, give or do for him. To sum it up if we can adopt him we will. He is our son in a lot of ways. When you meet him you will see what a change HE done for Charlie and in his life; we give HIM all the glory. We are very excited to see Charlie at camp this summer, and we are grateful for the progress in his and for Mike and Elisa for taking such good care of him. Praise the Lord! This entry was posted in Bring Me Hope News on May 20, 2010 by admin. This entry was posted in Bring Me Hope News on May 13, 2010 by admin. We in the west all know about ‘tough love ‘- making hard decisions for the ultimate good of your child. For example sending them to school without their homework (or in their pajamas) or letting them learn to clean their room! Some parents in China really have to make harder decisions for their children and I have heard about two lately. The first is a little girl with spina bifida – only discovered at birth and she was abandoned soon after. She was left with a note that said ‘we are poor village farmers and can’t afford the operation. Please look after our baby girl “. This family had to decide to live without their daughter forever – knowing that her only hope of an operation was if she was an orphan. The second was a heart breaking story of a 6 month old girl with severe liver failure. She has obviously been in a loving family who had realized that she was dying and abandoned her in the hope that someone would be able to help. Sadly this little girl died a week later – away from her parents and the love that she knew. I can only imagine how hard it was for her parents to leave her knowing that they would never see her again. She was taken in and cared for by an English couple who are looking after dying infants – they also hope to support families so that they no longer need to abandon very unwell/dying children. 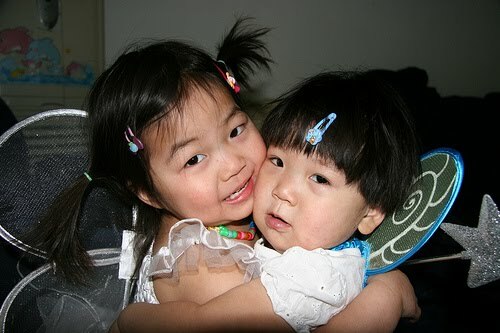 “China Kidz” serves by establishing and running children’s hospices. If you would like to help them in anyway though donations or volunteering, I know it would be much appreciated. They are doing a wonderful job in caring for these children. This entry was posted in Bring Me Hope News on May 10, 2010 by admin.